Late in Elaine Stritch: Shoot Me, the film’s subject sits, weakened and alone, in a hospital bed, waiting to die. She’s coming off a series of fresh triumphs—a wonderfully reviewed cabaret show that she’s taken on tour, more episodes of 30 Rock (where she played Jack Donaghy’s mother), and the kinds of tributes one gets only when closing in on 87. Yet, she’s struck by the palpable sense of death all around her, by her fear that once it’s over, she will find what’s beyond to be a great, big nothing. 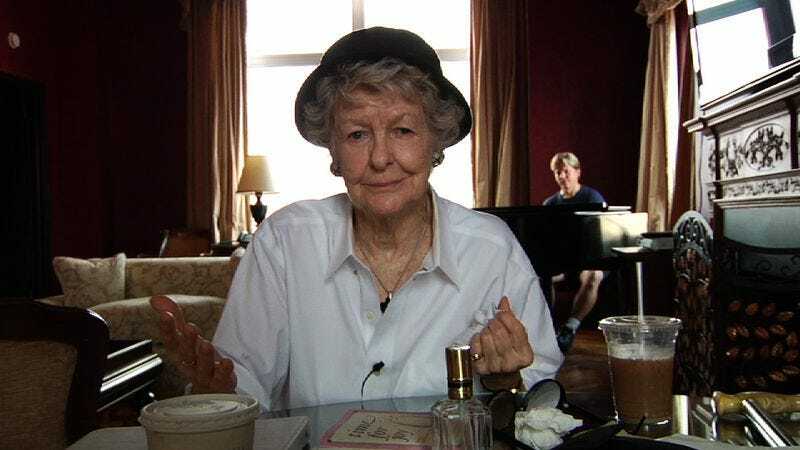 Earlier, her friend, the director Hal Prince, said that to truly understand Stritch is to remember that she went to school in a convent and that little girl has never entirely left her, no matter how brassy and fearless she might seem. To watch these moments in the hospital is to see the culmination of what the film presents the actress as: someone making constant, hopeful, but profane bargains with God. Director Chiemi Karasawa is on her best footing when she deals with Stritch not as a Broadway icon and occasional film and TV star, but rather as a woman approaching 90 and holding on thanks to lack of filtering and an indomitable will to perform. Karasawa’s cameras are there for both Stritch’s triumphs and her low moments. They capture the actress receiving her adoring public and friends in the show business community, but they also see her so frustrated about being unable to remember a song lyric that she seems ready to storm out of New York entirely. For its first 15 minutes or so, Shoot Me simply follows Stritch around New York, from job to job, getting a sense of the rhythms of her life at this stage in her career, and the film is at its most fascinating in these scenes. Unfortunately, that’s not the whole movie. Karasawa’s instincts to situate Stritch as an influential figure in the Broadway community and one of the last remaining links to the golden age of American theater are correct, but she too often abandons Stritch telling stories in her own words for talking-head interviews and clips of the woman’s work that are necessarily limited and probably better experienced in context. (This is particularly true of a long excerpt from D.A. Pennebaker’s Company: Original Cast Album, featuring Stritch’s now famous attempts to nail her signature song, “Ladies Who Lunch,” for posterity.) It’s nice to see Tina Fey, Alec Baldwin, and James Gandolfini sharing their thoughts on what Stritch has meant to them—particularly welcome is Fey’s candor about how demanding Stritch can be—but it doesn’t really add any insight that can’t be acquired simply from watching the woman go about her day. Yet, the more traditional biographical documentary material is ultimately a small percentage of the film. The chief pleasures of Shoot Me—and there are many—come from watching Stritch navigate her day-to-day life. Look, for instance, at the way she tries to take control over Karasawa’s film and direct the camera operators where to go as she opens a package of English muffins, or how she calls out her own stage directions for an episode of 30 Rock she watches. Or, even better, listen to Stritch tell stories from her long, varied career or about her twin struggles with diabetes and alcoholism, both of which continue to mark her late in life. Then there are those moments at the end, when Stritch comes up against the eternal and seems to finally have found something even she must shrink away from. Shoot Me doesn’t really find a gear beyond “pleasant afternoon spent with older relative,” but when that older relative in question is such a vivacious, essential presence, it feels like time well spent nonetheless.